Happy Monday Beauties! Its been a minute, but I’m back. I pray you’re all fit and fine. 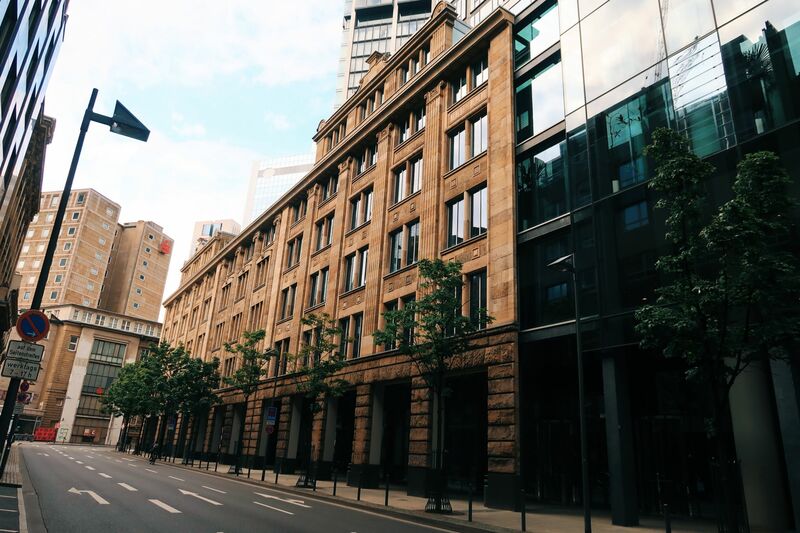 Continuing the diary of my trip to Frankfurt, I thought I share some more posts on how beautiful this city is. I’m not going to take much of your time to rant on because I believe I said enough on why you should consider visiting some day. Ha!! 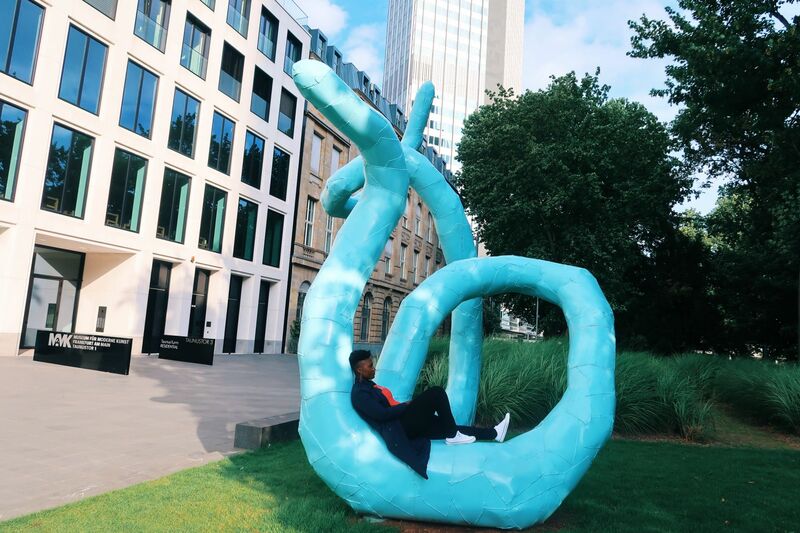 So what’s that one place to visit when you visit Frankfurt? Main Tower is the place to be. Take a minute and imagine the breathtaking view from a plane which is few minutes away from landing. 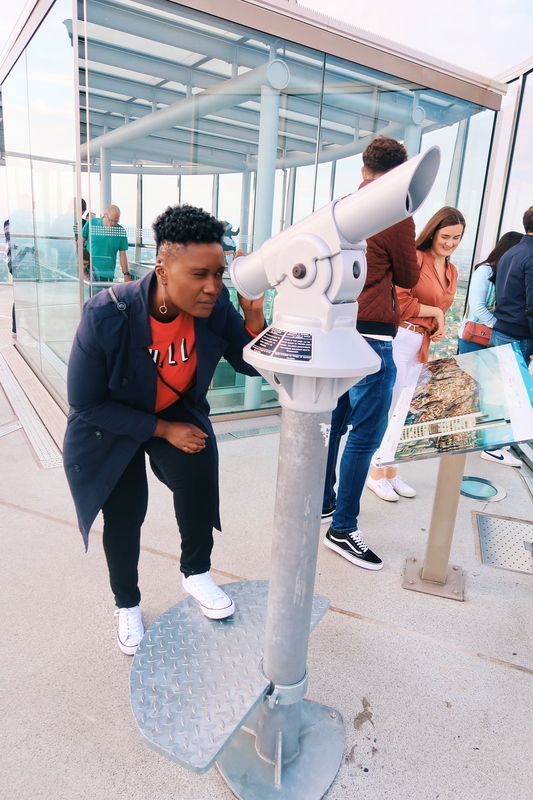 Yes, this is exactly the same experience, except that you’ll be admiring the view of Frankfurt city and its surrounding areas from a 200m high skyscraper (56 storey). The building offers a gym, souvenir shop and restaurant/lounge to wine and dine. I really enjoyed my visit as you can see from all these shots. The sightseeing doesn’t have to end there. Few minutes walk from the Main Tower is the European Central Bank and also the opera house. There is so much to see I promise you. Opting for comfort with my outfit was the best, especially with the sneakers. At the end of the day, I was knackered as hell. The weather was a bit chilly so I brought the light trench coat to keep me going. Hope this travel guide will be helpful to someone out there. Have a blessed week Beauties! Thankful for your thoughts. Looking great, Missy. Looks like you had a blast. Love your photos! Thanks much Len. I sure did and good to hear that. I always go for more comfortable outfits when I travel as well. It can be quite tiring as it is, no need to add physical discomfort due to clothes to the mix. Your photos are lovely. Thanks for sharing your tips for Frankfurt. Couldn’t agree more Kathrin. Thanks so much. My pleasure! Thanks much Ann and good to hear that. What a fun trip, Missy!! Going to new places really causes us to grow, I think!! Wow it seriously looks like an amazing place to visit! It sure is Rach. Thank you! I would love to see Frankfurt! That tower sounds amazing, but ohhh I do not handle heights well! Ha! Gorgeous views! Hope you do Carrie. Aw….such a shame! Ha! Love your cool casual look! Those sneaks are perfect. 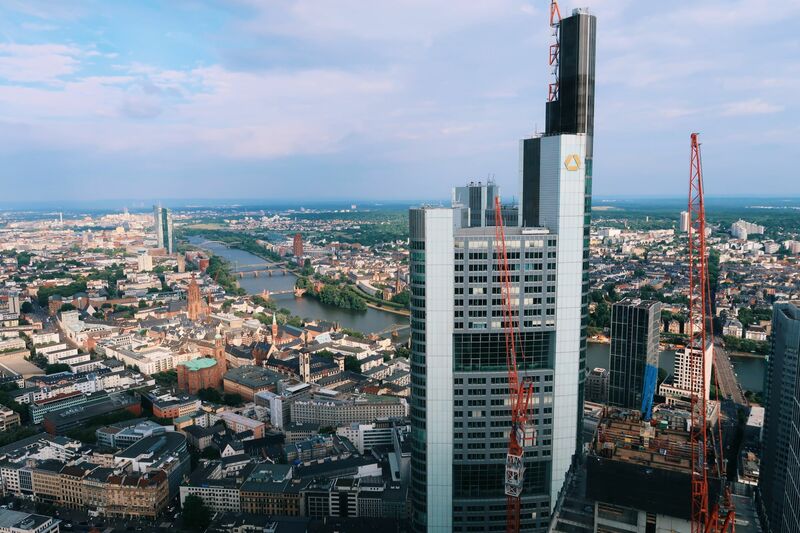 Frankfurt looks and sounds like an amazing place! Good to hear that Kathrine. It sure is. Thanks much! I sure did Allie. Good to hear that and thank you. Hope you do Jane. You’re an adventurer so I know you’ll love it. What a beautiful city! I like it that you went to an observatory place to see the whole area. It sure is! Thanks much! Frankfurt looks amazing hun and loving your pictures. The view is amazing ! Amazing place and great pics! You picked a great spot for the photos too. . .
Good to hear that Nina. Thanks ever so much. I’m always up for seeing sights like these. I’ve been to frankfurt, but only at the airport. Would love to explore! Welcome back! It looks like you had such a wonderful time, beautiful! Frankfurt is too pretty! Love your sneakers for some sightseeing- so smart! I love your Travel Diary series, my beautiful Mavis! 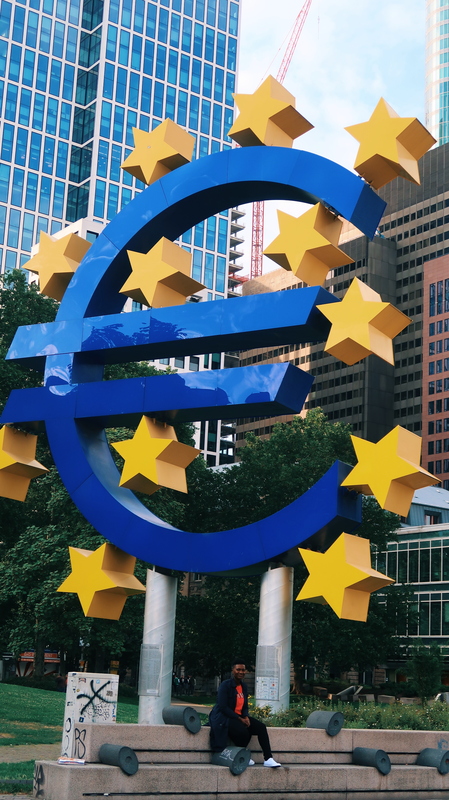 I have been to Frankfurt once and my ex actually worked at the ECB at one time. I also have a picture of that sign somewhere. 😉 Great shots at the top of that building. Your sneakers look comfy too. Have a great rest of your week! Good to hear that my beautiful Lizzy. Wonderful! It sure is indeed! It looks amazing there! Thank you for sharing! I’m still yet to go to Germany! Thank you Lorna and hope you visit some day. Couldn’t agree more Sara. Thanks much! Hug! Oh wow! It’s so lovely to see travel post on your blog; you look quite at home there! The views from that rooftop look beyond incredible; ah, wish I was there! This your travel looks so interesting. Beautiful and stunning place. Besides I read the write up ..like how t was out together. Thanks so much Melody. Good to hear that. Wow! This place is so beautiful. I love to get comfy when I visit new places. You never know what stairs you have to climb. You look lovely. It sure is sis. Ha!! I know right!! Thanks much sis. Frankfurt look an awesome place! Beautiful pics, gorgeous. It sure is and thank you, E.
These photos are amazing! I love Frankfurt, and hold Germany close to my heart! Thanks for sharing! Looks like an incredible trip!! 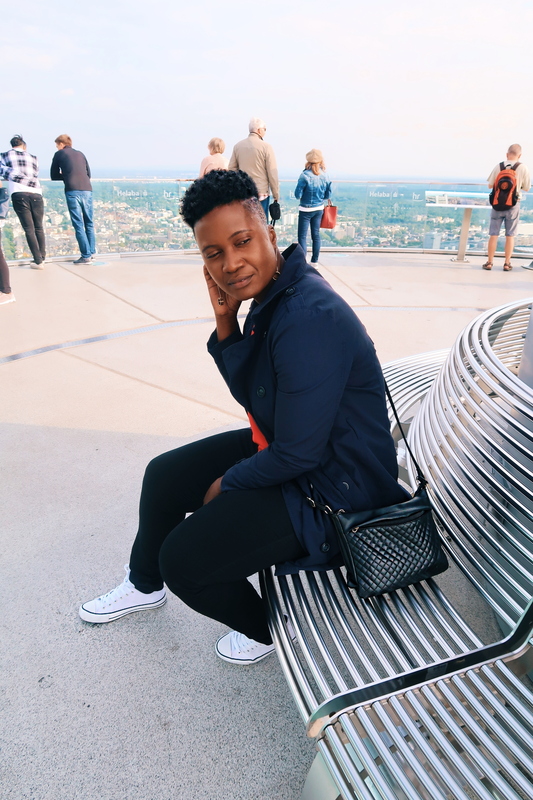 Dear Missy May, I see you know Frankfurt better than I do 🙂 The main tower is obviously really worth to visit and I like you in your casual look! Gosh this is so embarassing. I live close to frankfurt but never visited this place. I’ve never been to Germany but would love to, Frankfurt looks fab! Main Tower looks fab, look at those views! Glad you had a lovely time and you dressed for the occasion perfectly! I have been in Frankfurt but I didn’t visit this tower, what a pity! It looks like a great place with a great view! Hope you can some other visit. It sure is, Francesca. Thanks much! So pretty! Can’t wait to visit and see this for myself someday. Thanks much Minhal and hope so too.